Subject to correction, the product was first added on 2019-01-14 16:29:40 and the last date we have for this product is 2019-01-14 16:29:40, where the last unit was sold for R 1305, which may have been a final clearance price. 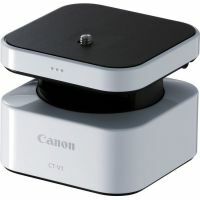 Canon CT-V1 Wireless Pan Cradle (For Canon video cameras) Copyright © 2019 ComXpert International CC - COPYING IS ONLY ALLOWED FOR THE PURPOSE OF SENDING US ENQUIRIES. E&OE. The Canon CT-V1 Wireless Pan Cradle supports for VIXIA mini X & VIXIA HF R62/R60/R52/R50 camcorders, providing you with remote panning movement via compatible iOS devices running iOS 5/6/7 and Android devices running Android 2.3/4.0/4.1/4.2, using the available CameraAccess Plus app. It features approximately 200° of remote pan motion, and ±10° of manual tilt adjustment. This allows you to mount the pan tilt cradle to a tripod or other mounting system with a 1/4"-20 threaded mounting stud, and control the pan from your compatible mobile device. The unit powers from either 2 x AA batteries, or you can power it using an your camcorder's AC power. It features a mini-b USB port, and both a DC in and out port, and you can charge the camera while it is mounted to the pan cradle. Provides approx. 200° of wirelessly controlled pan. Approx. ±10° of manually adjustable tilt. Box Dimensions (LxWxH) 7.0 x 5.6 x 5.1"
The best price and guaranteed service and backup from official computer suppliers in South Africa for the 9626B002AA Canon CT-V1 Wireless Pan Cradle. Find related 9626B002AA Canon CT-V1 Wireless Pan Cradle products in our Digital camera accessories Category for even more options. Read reviews and find out about 9626B002AA Canon CT-V1 Wireless Pan Cradle. Discounts, specials and cheap prices only at ComX Computers.